I had so much fun making my Great Granny Quilt, through the Great Granny Along that was hosted by Lori Holt. When I read that Lori is doing another quilt along, I knew I would jump right in. This time she's hosting a row along. Lori will be posting a tutorial every two weeks, starting this week, and we will make the quilt row by row through spring. This is going to be a scrap quilt. We are encouraged to use our stash, which I love. 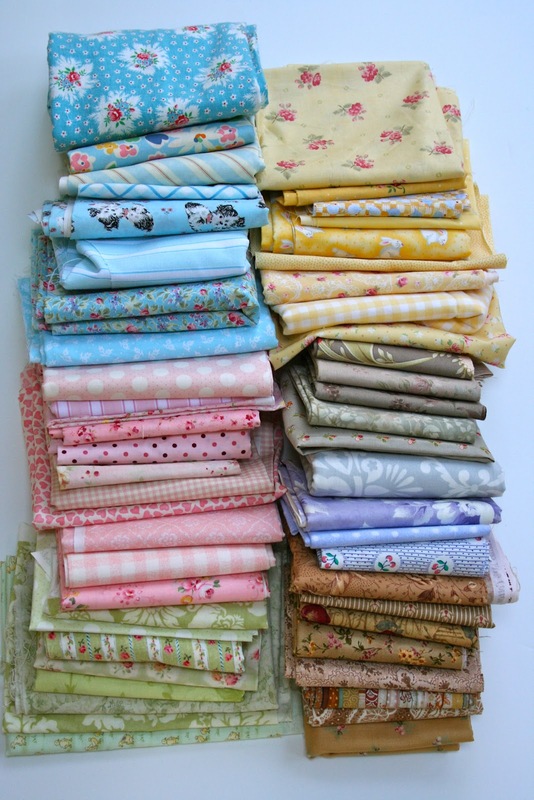 Lori tells how she chose her fabrics and how much we will need. I started pulling fabric right away. My stash tends to be more soft colors and I was a bit unsure of myself at first. I choose lavender over red as red seemed a bit harsh with the other muted tones. 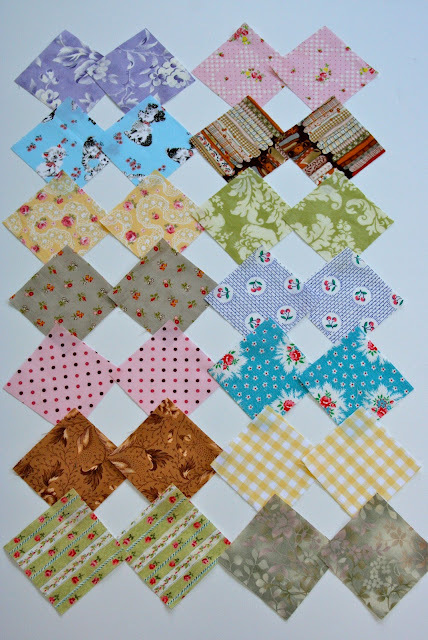 I then cut the 3" squares as directed and will await this weeks tutorial. I love that this is a beginner quilt and I urge you to give it a try with me. I can keep up with one row every couple of weeks. Lori's tutorials are very thorough and filled with pictures. I've gathered the fabric and found it very helpful to photograph and see what I might add. Looks like I need more lavender fabric, something I don't usually work with. I may have to go shopping, unless someone wants to make a trade with me. I hope you join in on the fun, c'mon let's row along with Lori! Ah, Renee, you've chosen beautiful fabrics. 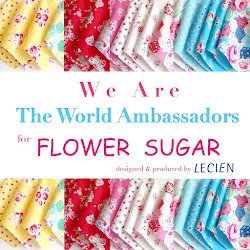 I'd trade lavenders if I had fabrics in the same genre as yours. Unfortunately, I don't. 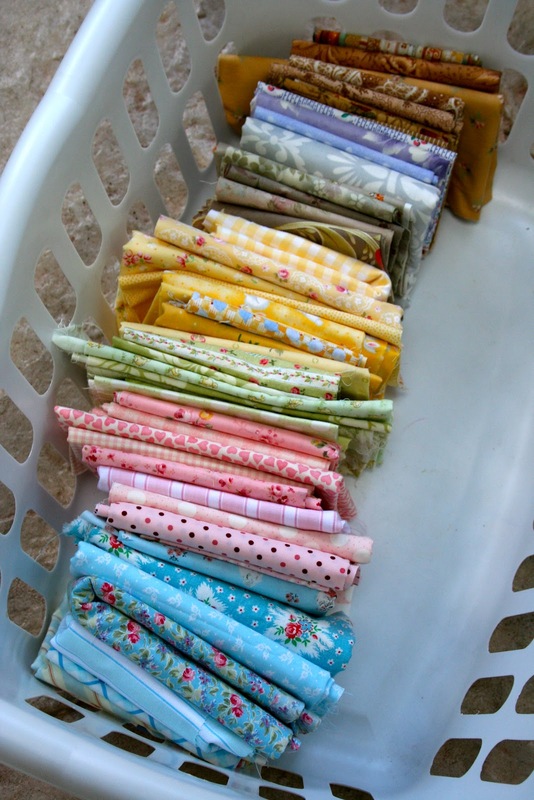 I just love the wonderful soft palette you chose for your quilts. I am going to row along too. :0) Wish I could trade with you ... I dont have a stitch of purple fabric. I visited Lori's blog and thought I would like to join in. I will have to go through my stash and see what I can come up with.